The ghostly, heart-broken track features Jonny Pierce of The Drums. It was a surprise to see The Drums vocalist Jonny Pierce's name on the tracklist of L.A. producer TOKiMONSTA's recent release, Fovere, but the track he appears on, "Giving Up," is gauzy and haunted, pretty and sad, and affecting. 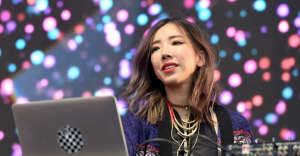 Today TOKiMONSTA has unveiled a surrealist video for the track, which reenacts the waning relationship Pierce that describes—It took me a minute to find the truth/ I'm giving up, I'm giving up on me and you. There is a tense dinner table scene, and kaleidoscopic imagery. Watch above. Watch the video for "Giving Up" above; Fovere is out now via TOKiMONSTA's own imprint Young Art Records.